1. 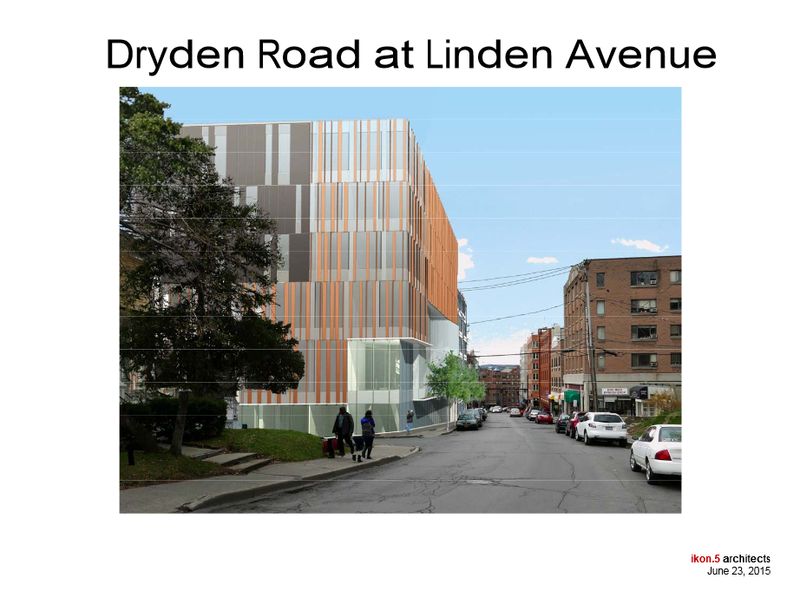 John Novarr’s project at 209-215 Dryden Road has been given the green light. 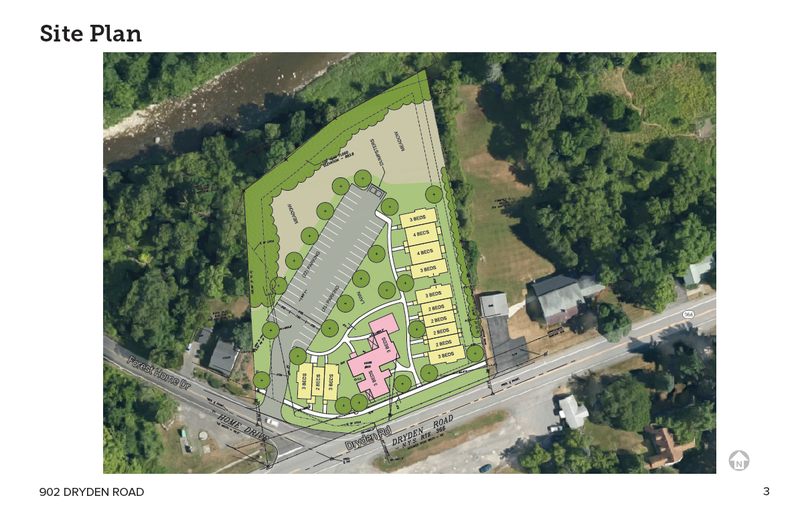 The city of Ithaca’s Planning and Development Board approved the $12 million project at their August meeting. With approvals in hand, Novarr is free to start construction as soon as he has his construction loans, which should be no problem given that Cornell’s MBA program has agreed to occupy the whole building (though only about 70% of the space will actually be used at initial completion; the MBA program will fill out the building as their needs require). Conveniently, Novarr won’t have to worry about site demolition and asbestos removal because he cleared the site in May. The 6-story, 73,000 SF building will begin construction in “four months” per the end-of-August Sun article, or November if the Site Plan Review (SPR) paperwork is still accurate. Completion of the building is anticipated for the second quarter of 2017. ikon.5 of Princeton, New Jersey is the project architect. When filled out, the building will house 250 employees of the university, and 450 students of the Executive MBA program, who only attend classes in Ithaca during traditionally slow periods of the year (winter break and summer break; during the rest of the year, students attend weekend classes in the town of Palisades in Rockland County). To that effect, the project would go a long way in easing the strongly cyclical consumer traffic that makes it hard to do business in the largely-student neighborhood. Students also stay at the Statler while on campus, and staff and students will walk over from Cornell faculty/staff parking to get to the building. 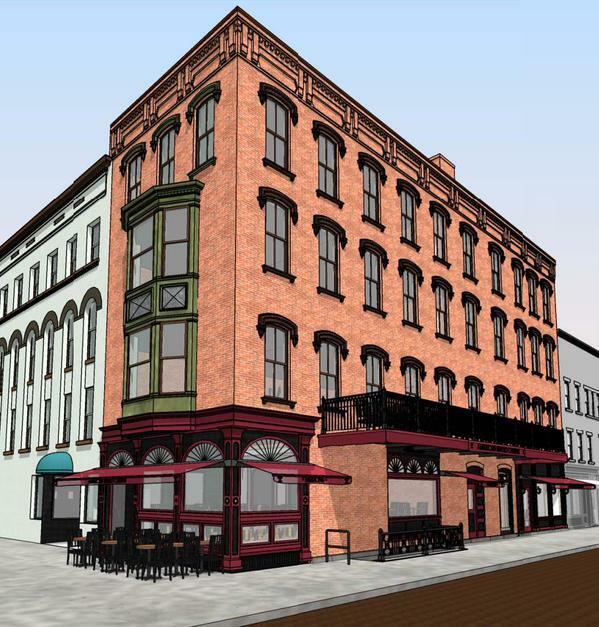 Last month, the Tompkins County IDA approved a 50-year tax abatement for the project, in the form of a PILOT agreement. With the other option of Cornell buying the property and making it tax-exempt, the county has decided that something is better than nothing. The project joins a slew of mostly residential projects under construction in the Collegetown neighborhood. 205 Dryden, 327 Eddy and 307 College are all underway, and several smaller projects were recently completed. The new investments total over $36 million, and with the exception of Novarr’s project, all the other projects will be taxed at full value. 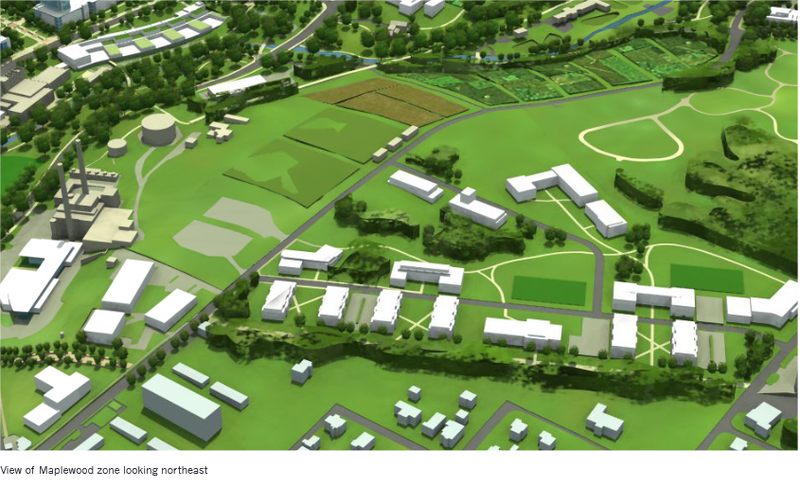 Going beyond the “disgusted” comment, most of the students that would live this far from Cornell’s campus would be graduate and professional students. Undergrads are less likely to have cars and tend to live in the neighborhoods immediately adjacent to Cornell’s core (Collegetown, Cornell Heights and parts of East Hill). Graduate and professional students tend to be like any other 20 or 30-something living on modest wages. The chances of a “keggers on Tuesday” kinda place are virtually nil. Also worth pointing out, Dryden’s town supervisor called Humerez out on that comment, saying she was saddened that renters were being described as a problem. 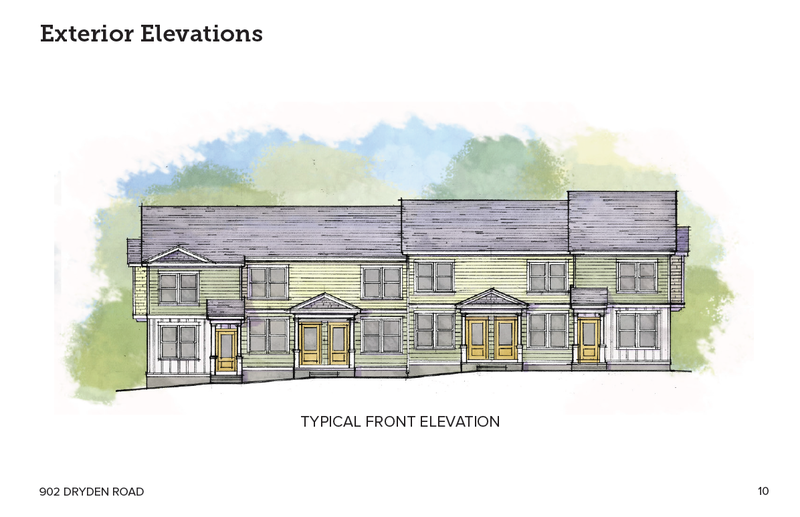 Cornell Plantations, as represented by Todd Bittner, has more legitimate concerns about litter, the driveway location and stormwater drainage; but glancing at the town minutes, it looks like the “I know we need development, just not in this neighborhood” argument also makes an appearance. The town board (in Dryden, it seems the town board oversees public hearings of the planning board’s agenda) is taking a more level approach; acknowledging that it’s a decent project, community input is important for good development, and by incorporating mitigation measures to assuage worried neighbors, this has the potential to be a worthy community asset. Expect this project to evolve as we go through the next couple of months. Also noted in the town minutes are plans for a 78,000 SF storage facility next to NYSEG at 1401 Dryden Road. Plans from a Cornell startup named “Storage Squad” call for “high quality, attractive self-storage” with 400 storage units in the first phase. 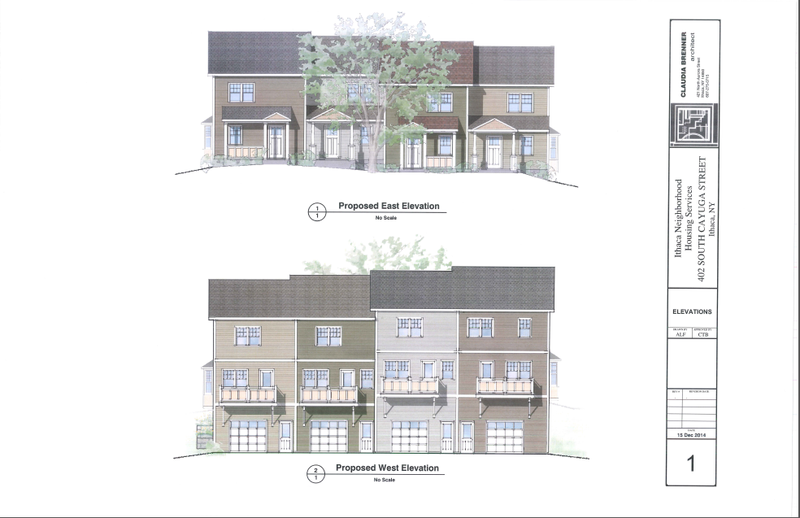 The project will need site plan review. 3. To anyone who’s passed by the vacant lot at 402 South Cayuga Street and wondered when INHS will start those for-sale townhomes: I’ve taken the liberty of checking. INHS director Paul Mazzarella stated in an email that “[t]he project is out to bid for a general contractor. The bids will be due next week. If the numbers are OK, we will start as soon as possible.” So barring any nasty shocks in the bids, the four-unit project (1 3-bedroom, 3 2-bedroom) will start in just a few weeks. As with other INHS projects, the units will be sold to qualified first-time homebuyers with modest incomes (anecdotally, that means the $40k-$50k range…it seems like half the buyers in the past year or so have been teachers in the ICSD). 4. In a rare bit of bad economic news in Ithaca, Ithaca College has announced its intent to slash about 40 staff positions from its workforce. This follows 47 job cuts in academic year 2014-2015, 39 of which were vacancies. The cuts are part of an effort to bring tuition costs and help the college stabilize enrollment numbers, which have been sliding down lately. No faculty positions will be eliminated as part of the layoffs. 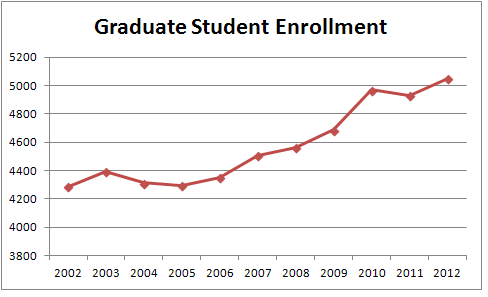 IC currently has about 1,070 staff and 730 faculty, about 200 more than they employed a decade ago. 5. The rumor mill said that a reporter from the New York Times was in town last Friday, and apparently they liked what they saw; the piece in the NYT takes a very positive and gracious approach with Ithaca and its recent urban developments. If you haven’t read it already, the link is here. 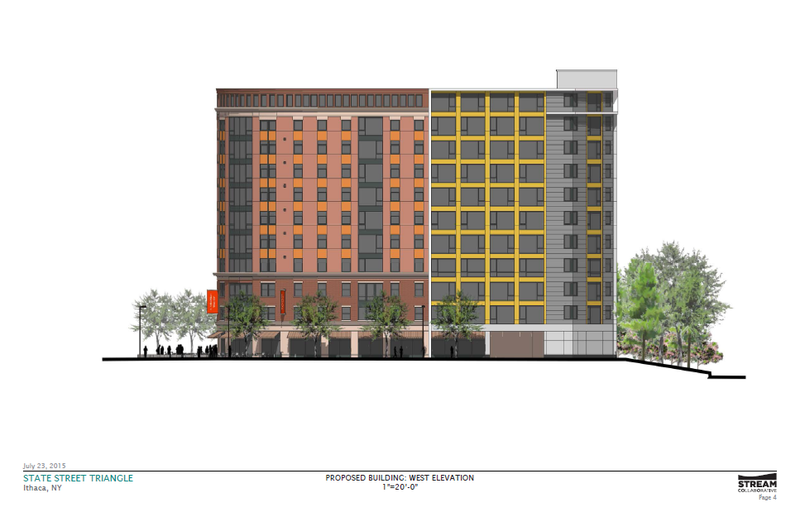 More importantly are some useful details in the piece – one of which is that we now know the revised mix of uses for the 11-story Harold’s Square project calls for 86 apartments, up from 46 when it was first approved in 2013. The apartment units will be a mix of 1-bedroom and 2-bedrooms. Readers may recall that the project dropped two floors of office space in favor of two floors of apartments. The project also includes about 11,000 SF of retail on the Commons. “Rev will be out at the end of September. We’ll probably begin demolition after the first of the year, after the holiday shopping season, we don’t want to be a nuisance to Christmas shoppers. We’ll have pop-up store space available during the holidays. They’re not solid, but those are out plans. We’ll see how it goes”. Also, the project will be going back to the planning board. The project was originally approved in August 2013, with a CIITAP tax abatement package approved two months later. However, putting a financial package together has been a task. 6. For those keeping an eye on the Simeon’s reconstruction, expect to see some progress in the next couple of weeks. That’s according to an interview the Sun conducted with Simeon’s co-owner Rich Avery. The timeline has yet to be finalized, but the new restaurant space and luxury apartments are anticipated for completion by late next summer, with the resturant re-opening as early as February. “Following her discussion on maintaining and promoting diversity among graduate students, Garrett announced the creation of new graduate student housing. Heads up folks, East Hill Village isn’t even a thing a yet, it’s just a concept from the master plan. Anyway, this goes along with Ithaca town supervisor Herb Engman’s comments to the county that Cornell is engaging with consultants to bring a plan forward. There’s nothing else known about the plans, and it’ll be a few years before any students start moving in to new Cornell-sponsored digs, but everything has to start somewhere, and Cornell’s created quite a deficit for itself when it comes to providing adequate amounts of graduate housing. Also, note the “collaborating with private partners” bit – these may or may not be tax-exempt, we shall see what happens. 8. Here’s the latest update on State Street Triangle, courtesy of the Ithaca Times. I have to admit, although I technically compete for eyeballs via the Voice, I like Josh Brokaw’s writing, he tends to be a bit of a wiseass and it’s entertaining. The big hang-up is massing. Not height, not tenant mix. A couple of ideas floated or suggested include height setbacks or overall reductions, and a redesign of the facade to make it appear more like separate buildings built next to each other. According to Brokaw’s piece, some landlords are even questioning the need for new units, saying that all these new units could drive prices down. Captain Obvious just arrived into port. By the way, given the recent growth in general and student populations and corresponding increase in demand for living space, if a landlord is having trouble filling their units right now, it’s probably not the city’s fault. Campus Advantage has already spent $500,000 on the project, but it doesn’t seem like they’re going to throw in the towel just yet. They were probably hoping for an approvals process as easy as their Pittsburgh apartment tower, but…live and learn. Well this has been an interesting entry. 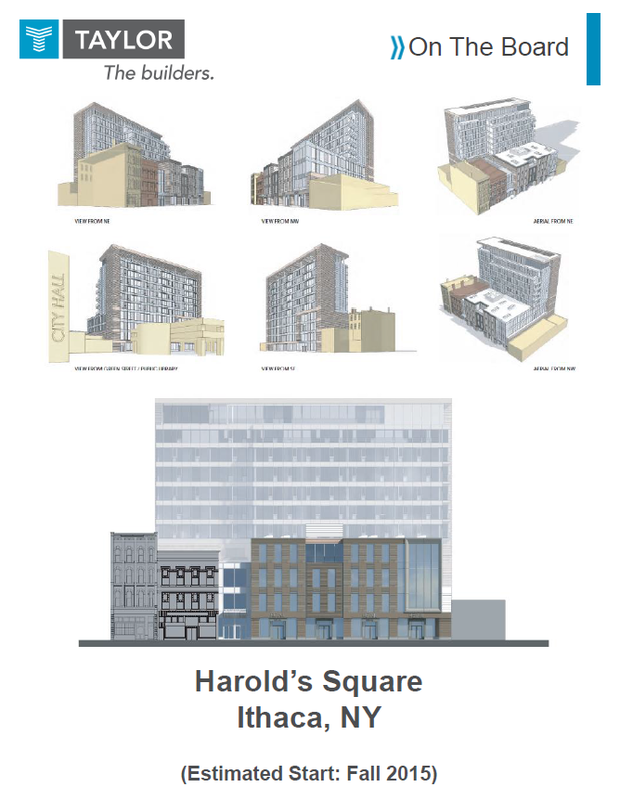 Even though there are people boo-hooing the Harold’s Square project, I feel confident that will actually happen (sorry I don’t feel as sure of the Triangle proposal). Last time I was in town I noticed the South Cayuga Townhouses hadn’t started yet. Got me to thinking that the taller proposals in the CBD could help relieve some of the housing shortage, there are still quite a few lots available just outside downtown (but well within walking distance) that could be used for more dense housing projects like townhouses. I’m not a bit surprised there is opposition to the development proposed for Varna (Town of Dryden). It’s kind of an isolated little hamlet with plenty of oldtimers. That said, I think all the kinks in the project could be worked out, and the proximity to Cornell is going to put more development pressure on Varna. Now if we were talking about Forest Home…..yikes. East Hill Village fascinates me. With the East Ithaca area growing, it seems the area between that burb and Cornell would fill in. I do wonder about traffic issues (sorry, not trying to sound like a Nimby). Thanks for all the info BC. It’s too bad Novarr’s building is so ugly, because it’s a great size and use case for that location. Those mismatched windows will probably look dated in five years, or whenever the next weird architectural fad comes along, long before the building has outlived its usefulness. Honestly, I’m not a fan of it either, but Novarr really, really likes ikon.5’s work. He had them design the guest house on his property in Cayuga Heights. I feel like it’s almost a given at this point that when he proposes his next Collegetown apartment building, ikon.5 will be the architect.